Joyce Glasser reviews Dunkirk (July 21, 2017) Cert 12A, 107 min. Christopher Nolan, the first director to make a big-budget feature film about the evacuation of Dunkirk makes big movies, many about big men. He works with big budgets ($230 million for Batman: The Dark Knight Rises); big casts; big ideas and big images. In Dunkirk , Nolan is not only going for big, but for immersive. With images captured not only IMAX format cameras, but on 65m film stock, and a score by German composer Hans Zimmer – whose relentless, pounding base is the musical equivalent of a Luftwaffe bombardment – this is one film you must see on the biggest screen possible. 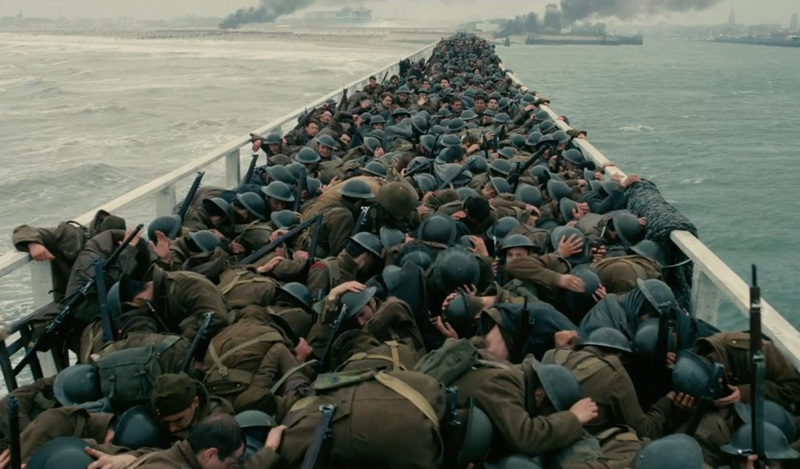 Nolan’s aim is to put the audience on the inhospitable beach as a sitting duck for the Luftwaffe; in the uncomfortable, perilous cockpit of a Spitfire; on a Red Cross ship or a tempest tossed small ship that some patriotic yacht owner sailed across the channel when his country called. And Nolan does just that in a tour de force exhibition of filmmaking that, sadly, lacks a story. 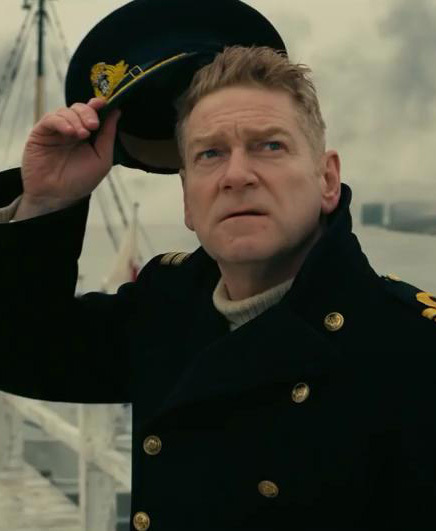 Eschewing CGI for effects made in the camera; shooting on the actual Dunkirk beach (where his team rebuilt the jetty known as the Mole) in the same spring period; using real spitfires and 9 of the original small ships (credited in the end credits), Nolan goes for authenticity, right down to the laces on the privates’ boots. His script and characters are a composite of dozens of participants, based in part on the wildly differing testimonies and perspectives of veterans. He is determined to engulf us in the horrific, miraculous turmoil that was Dunkirk. 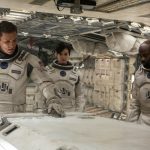 If Nolan is famous for his Batman trilogy of 2004, 2008 and 2012, he is equally well known for bending our minds with the space-time continuum, beginning with his fascinating, Memento, and progressing to bigger budgets, themes and sets with the baffling Inception and the Sci-Fi thriller, Interstellar. So it is not surprising that Nolan wants to play with time with Dunkirk , his first historic film. Captions superimposed on the instantly immersive action suggest that the film will show the three major components of how the Dunkirk Spirit ‘‘snatched victory from the jaws of defeat’: The Mole, the man-made jetty into deep water from the shallow beach (one week); The Sea (one day); the Air (one hour). 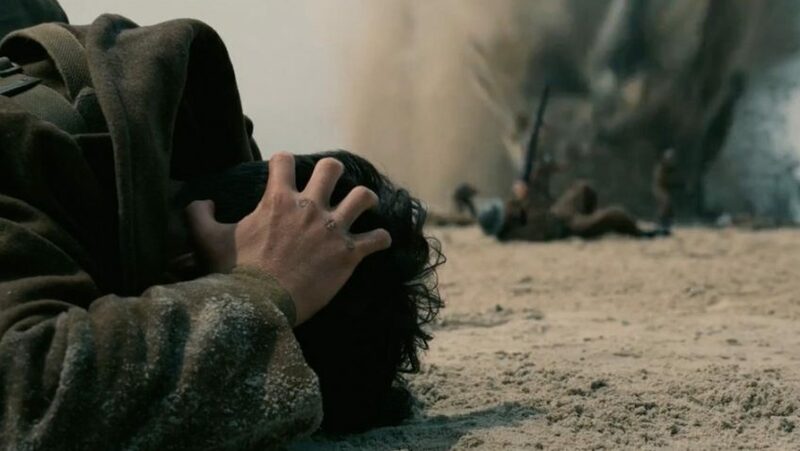 Unlike Steven Spielberg’s Saving Private Ryan which showed the D-Day battle, Dunkirk was not a battle as the British Expeditionary Force (BEF) were helplessly trapped, having been pushed further and further back from their defence lines deep in France and Belgium by the German Blitzkrieg. Hitler, however, stopped the land invasion and, sure of victory, relied on the Luftwaffe to finish off the beached troops. The Belgium and the Netherlands had been invaded and the Danish allies had already surrendered. If the 330,000 odd soldiers on the beach had not been evacuated, England might have been forced to surrender too. While Churchill said, “wars are not won by evacuations,” WWII might have been, for the evacuation saved the British army and sparked a morale boosting public spirit. In the brilliant opening scene British soldiers in their wool coats, backs to us, wander through the deserted town of Dunkirk, where German flyers warn them that they are trapped. 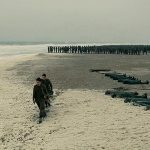 One young soldier, Tommy (newcomer Fionn Whitehead) dashes behind a French barricade onto the huge expanse of beach where queues of soldiers are waiting to be saved. The beach is too shallow for ships so thousands of men squeeze onto the Mole waiting to board a ship. Desperate to reach the safety of the destroyer about to depart the Mole, Tommy and another raw, young recruit (Aneurin Barnard) pick up a wounded soldier in a stretcher. Will they make it to the ship before it pushes off? They do, but then get kicked off and hide under the Mole just as s Luftwaffe destroys one of four rescue ships sunk in the course of the film. Churchill is nowhere to be seen as we are experiencing the war through the eyes of the soldiers, seemingly abandoned by the home command. A group of privates, using their wits to survive, hole up in the hull of a beached, rusty boat waiting for the tide. Suddenly shots are fired into the hull and panic ensues. The almost indistinguishable, good looking young men (who include the One Direction singer and Heartthrob, Harry Styles in his film debut) look like a Burberry advertisement and their exploits are sometimes confusing, but the action is always harrowing. The action cuts back and forth to two the two spitfire pilots, the first of whom is the heroic Farrier played by Tom Hardy (The Revenant). Until the very last shot, Hardy is in the cockpit of his Spitfire, face covered, and words muffled, almost as badly as they were in The Dark Night Rises, when, as the villain Bane, his face was masked in a muzzle instead of an oxygen mask and radio transmitter. Hardy also spent almost the entirety of the film Locke behind the wheel of his car, but, unlike the brilliant dialogue and characterisation in that film, nothing but Farrier’s heroism is made known to us. Historical advisor Joshua Levine ensures that the Spitfires, which the troops on the beach could not see, are given their due here. In one scene, an angry soldier addresses Collins, asking, ‘where were you, mate?’ ignorant of the fact that 145 spitfires were lost preventing more Luftwaffe from making it to the beaches. The 107 minutes fly by in a phenomenally entertaining and visually stunning piece of filmmaking that does justice to the subject. But I did not cry as I did in Mel Gibson’s WWII film, Hacksaw Ridge. That might be because, with the exception of Insomnia, which he did not write, Nolan is interested in spectacle over character; and in the visualisation of concepts over reaching into the heart of the subject — and the audience.